I might not have woken up just after 4:30 yesterday morning if it weren’t for our squeaky living room swinging slowly open. It had been pushed from its balance by what seemed to me like a long, but not particularly strong earthquake. 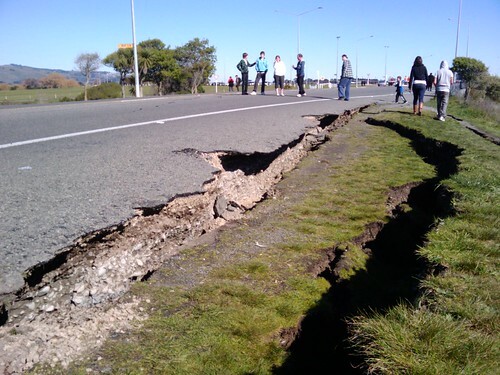 Of course, it turned out that it was a particularily strong earthquake, 7.1 on the Richter magnitude moment scale, shallow (just 10km below the earth) and close to Christchurch (putting it 400km away from my bedroom). Like everyone else, I woke up to see pictures of the damage in the city’s CBD. I don’t have any particular knowledge of geology, but I wanted to find out just what had happened underneath Canterbury to set the earth shaking. Perhaps readers here will be keen to learn too, so here’s what I’ve found out. That line between the snow topped peaks and the coastal plane to the West is the plate boundary.The 450 km long chain of mountains that rise as the Pacific Plate is thrust up against the Australian are synonymous with the rugged beauty of the South Island. But there are risks associated with living a country that is still inventing itself. As you might imagine, mountain building on this scale belies massive forces working under the earth. As the Pacific and the Australian plate slide against each other they carry the crust with them, and that means every now and again something has to give. There hasn’t been an earthquake along the alpine fault, which runs along the plate boundary, since Europeans arrived here to record them. It seems displacement between the two plates is more often expressed by quakes in the Marlborough Fault System in the North of the South Island. Yesterday’s earthquake was further south than the Marlborough system, along a fault that hadn’t previously been mapped. The fact GNS didn’t know the fault was there before yesterday doesn’t mean it’s new, it’s only possible to map a fault line from it’s surface expression, and it’s quite possible for the record of older quakes to be overwritten by fresh geology. Apparently, most of the movement in yeasterday’s quake was latteral (rather than up and down), similiar to the eathquakes we would expect from the alpine fault and the Marlborough faults. We’ll learn more about exactly what happened yesterday once GNS scientists have studied their siesmographs and surveyed the area, but we can already summise why the damage varied from suburb to suburb. Part of the reason the CBD was hit hard is that there are more old brick and stone buildings in the central city. Most newer buildings are built to sway in an earthquake, and the vast majority of New Zealand homes are built of wood which can flex and ride out a shake. By contrast, rigid buildings can only move so much before they give way. As you can see, i couldn’t fit as many stones in my “suspended” version of the gravel bed. All those stones and gravel have to go somewhere and under certain conditions the increase in pressure caused by liquifaction under the surface can form “sand volcanoes” that erupt through the topsoil. Jon Sullivan recored just that phenomenom in a Hoon Hay backyard. There’s plenty more coverage of the earthquake on the net. Geoblogger Chris Rowan has a post with a more thorough run down of the geological setting of the quake and sciblogs has Grant’s constantly updated post and some neat maps from Chris McDowall. Just being pedantic but the earthquake wasn’t 7.1 on the Richter scale it had a Moment Magnitude of 7.1. I have seen TVNZ also make this mistake. As I understand it, what ECan is saying is that liquefaction occurs in soil that is loose and uncompacted + wet, and during liquefaction the uncompacted soil becomes compacted, and the water shoots to the surface, causing subsidence + a layer of mud on the surface. But you seem to be saying that liquefaction causes the ground to RISE. Or am I misunderstanding? Perhaps I erred on the side of simplicity in putting that together. As I understand it, the sand volcanos form when silt/sand underlying a more solid base is compressed by an earthquake, that bulids up pressure and, in the right circumstances, it will burst through and ‘erupt’. In terms of the instability caused by liquefaction, it’s because during the earthquake the grains in the soil/sand aren’t weighinh on each other, and the whole thing can act like a fluid. As the ECan chart shows, once the shaking stops the grains will sort and the whole thing can settle lower than the original soil. Thanks for your prompt reply. I’m not a geologist either, I’m an artist, but very interested in science! Looking at the ECan charts of liquefaction potential over the city, the level of groundwater at the time of the quake seems to be key. Uncompacted subsoil seems to hold together OK if it’s dry, but not if it’s wet. 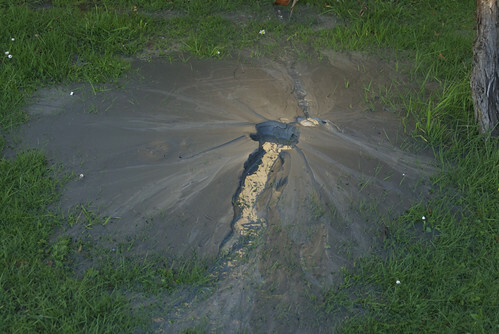 My understanding of the “eruptions” is that they’re not so much expelling silt/sand as they are expelling fountains of groundwater (shaken from between the grains of the uncompacted subsoil) and these fountains drag some silt/sand with them.